This helmet is new from Speed and Strength and is now available for pre-order. 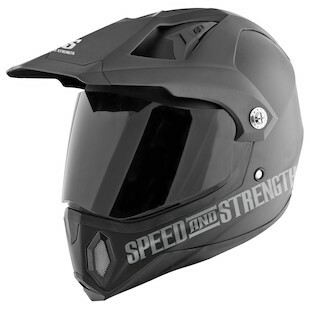 The Speed and Strength SS2500 Hell 'N Back helmet is a tricomposite Fiberglass shell with Cool-Core removable, washable and moisture wicking liner. Fitted with a peak visor and full frontal shield it can go from the dirt to the street and back. All Clear Sight System which is optically correct, anti-scratch, anti-fog and UV resistant faceshield gives you the best of both worlds, a true dual sport helmet. Also available in Hi-Viz. As soon as we have the helmets in stock, expect a video review.